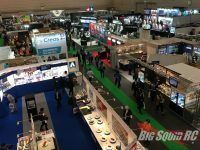 Shizuoka Hobby Show « Big Squid RC – RC Car and Truck News, Reviews, Videos, and More! You are browsing the "Shizuoka Hobby Show" tag archive. From the Shizuoka Hobby Show we see these new 1/32 scale Tamiya Mini 4wd Trucks, happily named “Jolly Joker” and “Sunny Shuttle“. These are the style that run on a closed track. You can see the guide bars on the front and rear. I bet they hall around there! In collaboration with www.HobbyMedia.it we will be bringing you some RC coverage from the Shizuoka Hobby Show 2010! Keep your fingers crossed for some exciting RC news. These shows cover everything from RC, to model figures, and this one is probably the biggest in Japan. Thanks to our friends at HobbyMedia for helping with the coverage.